The SalvisLab Vacucenter represents the optimal solution for oxidation sensitive substances and thermally instable products. It provides precise thermal conditions in dust-free vacuum atmosphere. 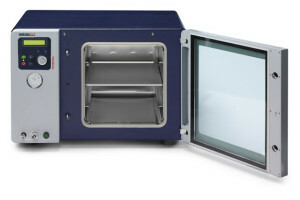 These characteristics enable highly successful vacuum drying applications for a wide range of laboratory applications in areas such as chemical engineering, pharmaceuticals, foodstuffs, cosmetics and electronics industry. The carefully designed wall heating system can be controlled within 0.1°C and ensures stable temperature conditions over the entire shelf area ranging up to + 200°C. SalvisLab Vacucenter meets GLP and GMP standards. The Vacucenter feature an exclusive pressure safety system. The viewing window consists of double pane safety glass. SalvisLab Vacucenter is classified in Safety Class 3.1. The chamber interior is made of high quality stainless steel. The insert shelves are manufactured from anodised aluminium, thus enabling efficient heat transfer and best chemical resistance. Return to atmospheric pressure is enabled by means of a precision needle valve for ambient air or inert gas. A cleverly designed input jet behind a fender plate permits pressurisation of the chamber without causing turbulence. The EasyMenu developed by SalvisLab enables intuitive programming of the SalvisLab Vacucenter. In just a few easy steps, temperature, gradient and hold time (optionally set vacuum and hysteresis of vacuum) can be determined. The PID controller featuring fuzzy logic characteristics controls temperature, timing and optionally the evacuation level. 50 programs consisting of 15 program steps each are at your disposal for program duration of up to 999 hours 59 minutes. The LCD display keeps you informed with all the desirable data over the entire process cycle. Digital vacuum display. The pressure in the interior chamber is measured with an installed pressure sensor and is displayed by a digital display. Vacuum control through vacuum pump digital vacuum control through solenoid valve and vacuum pump. Inside the chamber, all transitional areas between walls, ceiling and chamber floor are designed with convenient radii to enable easy and efficient cleaning. The door seal is made of Silicon, easy to clean and provides absolute tightness. It prevents heat and pressure loss as it also keeps vapours and gases from escaping.